Panasonic Corp may upgrade one of its battery plants in Japan to produce advanced-format battery cells for Tesla Inc if needed by the U.S. electric vehicle (EV) maker, a person familiar with the matter told Reuters on Thursday. Panasonic, currently the exclusive battery cell supplier for Tesla, produces cells for the EV maker at their joint plant in the U.S. state of Nevada - the so-called Gigafactory - as well as at two plants in Japan. The Japanese plants handle cylindrical lithium-ion "18650" cells, used to power Tesla's Model S and Model X vehicles, whereas the Nevada plant produces the newer, higher-energy density "2170" cells for the mass-market Model 3 sedan. Tesla reported a larger first-quarter loss than Wall Street expected, and its revenue fell far short of expectations. On Wednesday afternoon, Tesla reported Q1 revenue of $3.72 billion (up 36% annually thanks to the Model 3 production ramp), GAAP EPS of negative $4.10 and non-GAAP EPS of negative $2.90. 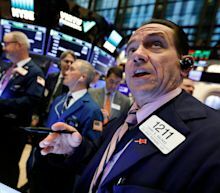 Revenue, hurt by lower Model S and X vehicle deliveries and a $501 million accounting adjustment, missed a consensus analyst estimate of $5.42 billion. Tesla plans to resolve logistics issues with global vehicle deliveries after weathering a challenging few months, also marked by staff layoffs and a public spat between Musk and U.S. financial regulators. Shares of Tesla, which are down 22 percent this year, were about flat after the results, which came more than an hour after they were expected. 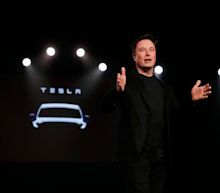 Musk is still battling to convince investors that demand for the Model 3, the sedan hoped to propel Tesla to sustainable profit, is "insanely" high, and that it can be delivered efficiently and swiftly to customers around the world. Musk, 47, assured investors that higher deliveries and cost cuts will help Tesla post a narrower loss in the second quarter and return to profitability the following three months. “There is merit to the idea of raising capital at this point,” Musk said on an earnings call Wednesday. 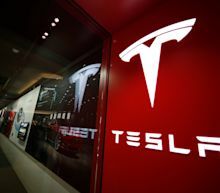 Tesla reported an adjusted loss of $494 million, or $2.90 a share, for the first quarter, missing analysts’ average estimate for a $1.30 deficit.